Sun Commercial Real Estate Inc. has announced the sale of a mixed-use retail building for $6 million. The deal closed Oct. 12. The 31,000-square-foot property is at 1205 Las Vegas Boulevard South. Cathy Jones , Anders Graciano , Paul Miachika , Roy Fritz , Jessica Cegavske and Taylor Vasquez of Sun Commercial Real Estate Inc. represented the seller, DeCar Enterprises LLC. Sun Commercial Real Estate Inc. has announced the sale of a mixed-use retail building for $6 million. The deal closed Oct. 12. The 31,000-square-foot property is at 1205 Las Vegas Boulevard South. Cathy Jones, Anders Graciano, Paul Miachika, Roy Fritz, Jessica Cegavske and Taylor Vasquez of Sun Commercial Real Estate Inc. represented the seller, DeCar Enterprises LLC. • A sale to KB Homes. The 4.62 acre land parcel is in KB Homes Development near the corner of Vegas Drive and Rainbow Boulevard (APN: 138-23-401-001). The transaction value was $1,725,000. Steven Haynes of Colliers International represented the buyer. Garrett Toft, SIOR, of CBRE Inc. represented the seller. • A sale to RW Investments LLC. The approximately 2.5-acre land parcel is on the northeast corner of Buffalo Drive and Teco Avenue (APN: 163-34-401-006). The transaction value was $1,600,000. Scott Gragson and Robert Torres of Colliers International represented the seller, Chaisson Buffalo LLC. • A sale to RH Centennial LLC. The 0.65 acre land parcel is at Village at Centennial Springs near Farm and Tule Springs roads. The transaction value was $850,000. Chris Clifford, Steve Neiger and Brett Rather of Colliers International represented buyer. • A sale to Southwestern Construction Inc. The 2,827-square-foot industrial property is in Northpointe Business Center at 4210 N. Lamb Blvd., unit 135. The transaction value was $297,000. Dean Willmore, SIOR, of Colliers International represented the seller, FJM Northpointe Associates LLC. Alex Stanisic of Colliers International represented the buyer. • A sale to Omaha Group LLC. The 1.46-acre land parcel is in Henderson Freeway Crossing near Lake Mead Parkway and Eastgate Road (APN: 178-14-602-003) in Henderson. Scot Marker of Colliers International represented the seller, Henderson Freeway Crossing LLC. • Deux Whops LLC dba The Great American Pub leased 4,620 square feet of retail space at 4145 S. Grand Canyon Drive, suite 109-111, from Grand Canyon Center LP. Total consideration was $1,331,114. Managing Director Michael Zobrist and Executive Managing Director Nelson Tressler of Newmark Knight Frank represented the lessor in the transaction. 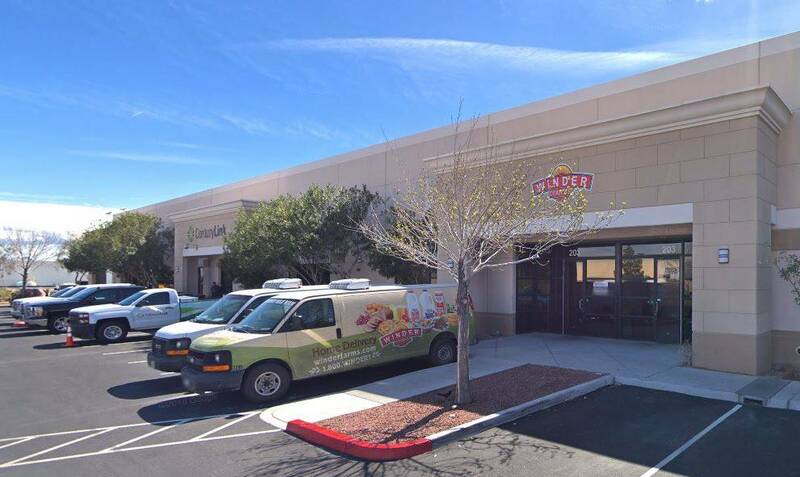 • A lease of a 13,293-square-foot industrial space to Ice Now NV LLC for $1,308,438.60. The space is at 6420 S. Cameron St. The landlord is York Decatur Crossing LLC, which was represented by RealComm Advisors. The tenant’s broker was Larkin Industrial Group, NAI Vegas. • The lease with JT4 LLC was completed Sept. 25. The 15,000-square-foot industrial space is at 4224 Arcata Way, Suite F, in North Las Vegas. The total value of the transaction was $713,323.38. Lisa Hauger and Timothy Erickson of Sun Commercial Real Estate Inc. represented the landlord, Sage Industrial Holdings LLC. Cushman & Wakefield represented the tenant, JT4 LLC. • The lease with Hemostasis and Thrombosis Center of Nevada was completed Oct. 9. The 4,365-square-foot office space is at 8352 W. Warm Springs Road, suite 200. The total value of the transaction was $464,008.68. Lisa Hauger and Timothy Erickson of Sun Commercial Real Estate Inc. represented the landlord, Capovilla Management LLC. Millennium Commercial Properties represented the tenant, Hemostasis and Thrombosis Center of Nevada. • The lease with Hurtlik Law LTD was completed Oct. 9. The 5,300-square-foot office space is at 6767 W. Tropicana Ave., suite 200. The total value of the transaction was $385,469. Sun Commercial Real Estate Inc. represented the landlord, Tropicana Trail LTD.
• The lease with Cornerstone Merchant Services was completed Oct. 5. The 1,855-square-foot office space is at 7881 W. Charleston Blvd., suite 110. The total value of the transaction was $241,950.36. Paul Chaffee, Wil Chaffee and John Kirtley of Sun Commercial Real Estate Inc. represented the landlord, Howe Family L.P.
• The lease with Bombard Electric was completed Sept. 21. The 10,300-square-foot industrial space is at 3725 Sammy Davis Jr. Drive. The total value of the transaction was $180,031. Lisa Hauger and Timothy Erickson of Sun Commercial Real Estate Inc. represented the tenant, Bombard Electric LLC. JLL represented the landlord, Dibiase Commercial LLC. • Legacy Martial Arts LLC dba Legacy Martial Arts leased 1,860 square feet of retail space at 771 E. Horizon Drive, suite 122-124, from Cornet Plaza LLC. Total consideration was $169,249. Managing Director Michael Zobrist and Executive Managing Director Nelson Tressler of Newmark Knight Frank represented the lessor in the transaction. • The lease with A Touch of Lash LLC was completed Oct. 2. The 1,850-square-foot retail space is at 8390 S. Rainbow Blvd., suite 108. The total value of the transaction was $110,389.50. Paul and Wil Chaffee and John Kirtley of Sun Commercial Real Estate Inc. represented the landlord, HSJC Investments LTD. Simply Vegas Commercial Real Estate represented the tenant, A Touch of Lash LLC. • A lease to Joseph Calvacante. The 5,707-square-foot industrial property is in Walnut Business Park at 3020 N. Walnut Road, Suite 180. Dan Doherty, SIOR; Paul Sweetland, SIOR; Chris Lane, CCIM; and Jerry Doty of Colliers International represented the lessor, MCA Walnut LLC. • A lease to Premiere OB/GYN of Southern Nevada. The 4,029-square-foot medical office property is in Seven Hills Business Park at 3041 W. Horizon Ridge Parkway, Suite 165, in Henderson. Alexia Crowley, CCIM, of Colliers International represented the lessee. • A lease to Andreas Sowa. The 734-square-foot office property is in Flamingo Grand Plaza at 1050 E. Flamingo Road, suite W-151. Chris Connell and Grant Traub of Colliers International represented the lessor, FKC Flamingo LLC. • DC Solar Solutions Inc. leased 71,043 square feet of industrial space in Pacific Business Center at 1070 Mary Crest Road. Jake Higgins of CBRE represented the landlord. • May Manufacturing LLC dba Artesian Spas leased 35,917 square feet of industrial space in Speedway Commerce Center at 6335 N. Hollywood Blvd. Zac Zaher of CBRE represented the tenant. • National Indoor RV Centers LLC leased 215,804 square feet of industrial space in Northgate Distribution Center at 4640 Nexus Way. Kevin Higgins, SIOR, of CBRE represented the landlord. • Detail K2 Inc. leased 10,658 square feet of industrial space in Harmon Warehouse Center at 4301 S. Valley View Blvd. Zac Zaher of CBRE represented the landlord.